Hotel Kasugai is located in Yamanashi Prefecture, far away from the city's hustle and bustle and is surrounded by beautiful nature. Our inn combines the omotenashi hospitality of a Japanese ryokan and the conveniences of a hotel. We offer a variety of room choices, such as our family room or our barrier-free room. Whether you are traveling as a couple, as a family, or as a group of friends, you can choose the room that fits your needs. Our guest rooms are carefully furnished to provide you with an upscale atmosphere. 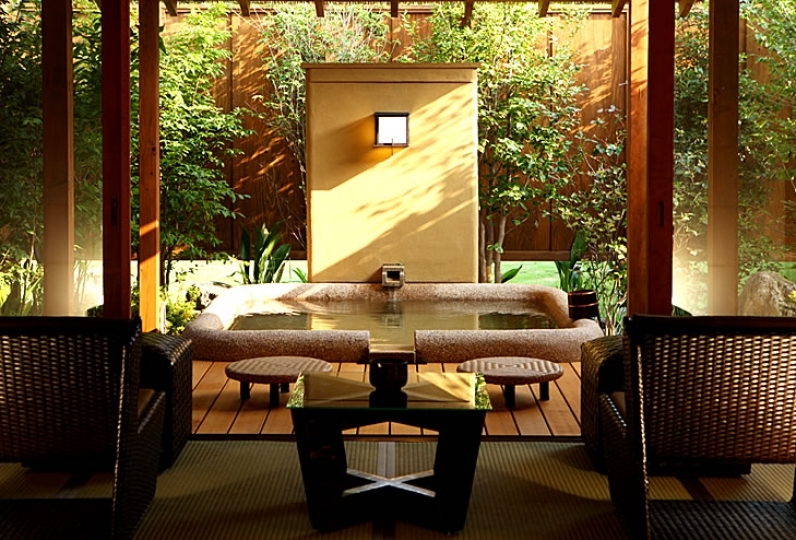 Our onsen is a simple alkaline onsen that is often referred to as a 「bath of beauty」. The soft, gentle water is full of moisturizing properties and leaves your skin dewy and silky after the bath. Enjoy a luxurious soak in our outdoor bath as you listen to the sound of the water and refresh your body and soul. 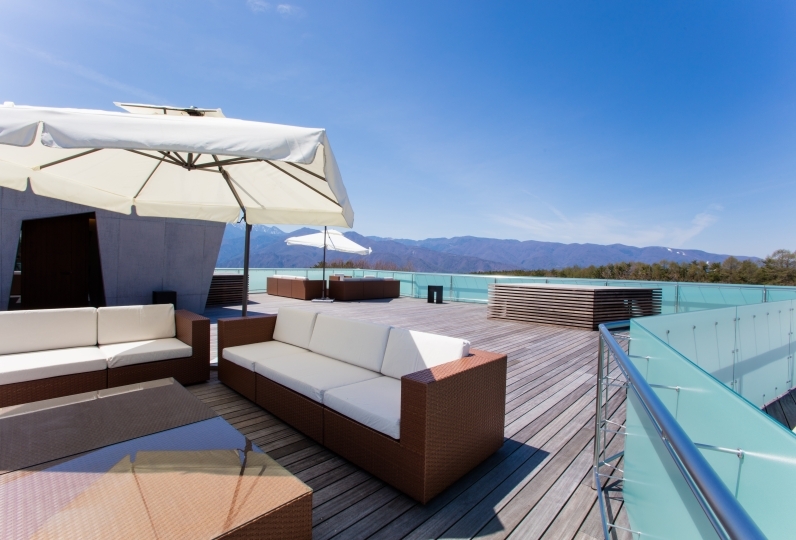 We offer a variety of other relaxing facilities beyond our onsen. Our bedrock bath 「Arashi no Yu」 contains 15 different types of medicinal stones and uses 100% spring fed water to provide a variety of healing and curing benefits that are characteristic of an ancient medicinal spa, such as improved metabolism. We also offer a luxurious spa designed to replicate a premium spa in a southern island resort. After relaxing in the onsen or the spa, enjoy your dinner at Hotel Kasugai with either Japanese kaiseki cuisine or Chinese cuisine. Our Japanese kaiseki cuisine features the seasonal flavors of local ingredients found in the natural surroundings of Yamanashi. Our Chinese cuisine is prepared with less oil to match the Japanese palate. Enjoy a memorable dining experience with our meticulously prepared cuisine. Enjoy a wonderful stay at Hotel Kasugai where you will be welcomed with warm omotenashi hospitality amidst the tranquil surroundings of Yamanashi. It was a trip with my mum, but the staff was kind and it was a fun time. I was taken care of taking photos and carrying luggage. I would like to stay again. Enjoy traditional cuisine or Chinese cuisine that has been prepared to match the Japanese palate in our stylish restaurant surrounded by glass windows. We also offer about 90 types of drinks, including Yamanashi wine, craft sake, craft beers, and soft drinks. Hotel Kasugai's onsen is a 「simple alkaline onsen」 that is often referred to as a ≪bath of beauty≫. The average onsen has a pH level of 8.24, but our onsen has a pH level of 9.36, making it wonderful for the skin. Our soft, gentle water is full of moisturizing properties that leave the skin dewy and has received high praise from our female guests. Experience our onsen water that fills our luxurious granite bath. At our wine bar Italian, take in the night view of the Kofu Basin as you enjoy over 90 different kinds of Yamanashi wine (Koshu wine). Our wine bar is said to have one of the best views in the Isawa-onsen area and carries over 400 bottles of our sommelier's carefully selected wines that focus mainly on the Katsunuma region. Experience a spa treatment produced by top international stylist Mitsuo Yamano, grandson of the legendary pioneer Aiko Yamano. Our bedrock bath Arashi no Yu is made of a 50cm thick floor full of 15 different kinds of medicinal stones that are heated up with the onsen heat. We then pour 100% hot spring water onto the stones to produce a mineral rich mist. At Hotel Kasugai, we strive to provide the comfort of a hotel and the heartfelt omotenashi hospitality of an onsen ryokan in order to ensure that our guests experience a memorable stay. We hope that our guests feel a moment of bliss many times over during their stay. We await your visit with this desire to serve our guests. At a hotel or ryokan, there are many types of visitors, from couples, families, friends, and even business groups. While each situation requires a different type of hospitality, the staff at Hotel Kasugai promises to provide the utmost in service to each and every one of our guests to ensure that their stay is full of moments of bliss. Escape the hustle and bustle of your day to day and come experience a blissful moment. ※There is a complimentary shuttle bus from Isawa-onsen Station.